This week: how journalists covered Election Day, Nate Silver and understanding big data, Macmillan’s move to stop its print edition and go digital-only in 2013 and Day 9 of the National Novel Writing Month. 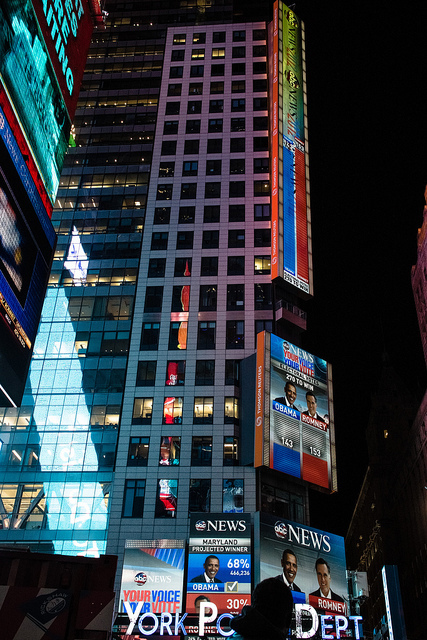 Image credit: “Times Square, Election Night 2012” by Dan Nguyen on Flickr. Used under a Creative Commons license (CC BY-NC 2.0). Prepositions are tricky. Sometimes our copy editors read sentences or phrases with prepositions more than twice just to ensure that the correct one is used. (Is it “compare with” or “compare to”? Don’t even get us started on idioms!) Some prepositions are now “straying into new territory” by acquiring new usage. True, new grammar words don’t burst onto the stage with all guns blazing, like some ‘lexical’ words do. So-called ‘open-class’ words – particularly nouns and adjectives – are often coined or dug up by journalists when the situation demands it, like omnishambles in the aftermath of the last UK budget. Omnishambles may make its way into the dictionary, or more probably it will sink into oblivion once the narrative that spawned it is forgotten. In general, new ‘lexical’ words and compounds are coined as and when needed, to name new objects and concepts. For example, not long ago we might have been mystified by this supermarket product description: fairly traded party size instant barbecue (printed without any hyphens), which now causes only fleeting puzzlement. New uses of ‘grammar’ words enter the language more gradually and without attracting much attention. This may be because the words themselves are not newly-minted or revived; instead, the same familiar little items are being drafted into new areas, annexing part of the territory of other members of their set. via Some changing uses of ‘grammar’ words: are you across ‘across’? | Macmillan. Using big words, whether to emphasize, exaggerate or just to flaunt your vocabulary range, may actually work against content. Read Stan Carey’s post on the Macmillan Dictionary blog and tell us if you agree that perhaps what we need is a linguistic deflation. Is linguistic inflation insanely awesome? | Macmillan.